Kingdom Hearts Final Mix is a Japan-exclusive re-release of Kingdom Hearts. It feautures english voice acting with japanese text. Also, it has some additional game material. In this version, Heartless are recolored, there are new cutscenes, new Heartless, new weapons, new enemies, there's a new difficulty level, etc. As this is a re-release of Kingdom Hearts, the story is the same. Sora, a young boy, lives with his friends, Riku and Kairi, in Destiny Islands. One night, Sora discovers that the islands are being attacked by dark monsters, called Heartless. Sora seeks for Riku and Kairi, he finds Riku but he disappears in a dark portal. 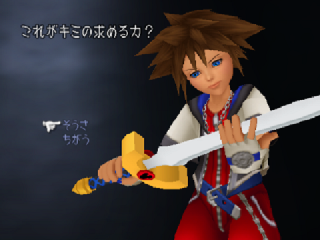 Now, Sora gets the Keyblade, which can destroy those Heartless. Now, Sora has to search for his friends with Donald and Goofy (who are searching for King Mickey) through various worlds. Now you can add videos, screenshots, or other images (cover scans, disc scans, etc.) for Kingdom Hearts - Final Mix (Japan) to Emuparadise. Do it now!